This absolutely stunning 5 bedroom home, custom built in 2013 for the current owners, is situated on a premier one block street in the north section of Briargrove. With over 5,500 square feet of living space, spacious outdoor covered area plus pool and spa, this home offers the ultimate in gracious living. Ideal layout for entertaining, the downstairs features a generous dining room, elegant living room open to cook's kitchen, private study plus light filled family room. Outside covered space includes summer kitchen, sitting area with fireplace plus additional covered space for dining. Upstairs features 5 bedrooms, 4 baths plus game room. Quality finishes throughout - plaster finishes on walls, high ceilings, wide plank walnut floors, designer fixtures including draperies, lighting fixtures and hardware. Recent addition of pool and spa plus yard with artificial turf and a fenced dog run. A must see for the most discriminating Buyer. Amazing 4 bedroom, 4 full & 2 half bath custom built Briargrove family home. The entry featuring limestone floors & Segreto plaster walls sets the tone for this designer's dream. Inviting study w/ built-ins. Formal dining with butler's pantry & wine cooler. Great room w/ gas log fireplace & reclaimed wood beams. Gourmet island kitchen with Thermador Professional line appliances. Kitchen opens to breakfast area & great room. Central wet bar w/ concrete counters, perfect for entertaining. Two downstairs powder rooms. Game room up w/ wet bar. 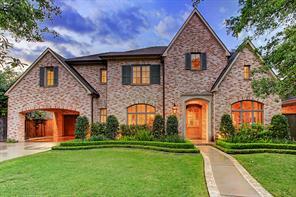 Large master suite w/ vaulted ceiling, wood floors & fireplace. Master bath w/ his & hers marble vanities, shower & separate soaking tub. Oversized closet w/ packing island. Three secondary bedrooms, all w/ en-suite bathrooms & walk-in closets. Family room overlooks sparkling pool. Outdoor kitchen with living & dining areas focuses on a wood burning fireplace. Two car garage & two car porte-cochere. Mosquito system & security cameras. A must see! Custom built by Brian Thompson for current owner, this home has superior custom details & finishes throughout. Elegant but livable, great for any type of entertaining. Lovely formals. Spacious den is open to true chef's kitchen with amenities including large island, two dishwashers, mud room w/ lockers, walk-in pantry, pot filler over gas range. Bar/butlers pantry with exquisite reclaimed doors, great storage, sink, beverage fridge, ice maker. "Mom Desk" command center is tucked under the back stairs, next to second half bath. Upstairs master is an oasis with beautiful bath, two walk-in closets. Four additional bedrooms, each with private access to bath and walk-in closets. Upstairs play/game room is perfectly located at the top of back stairs with a huge storage closet. 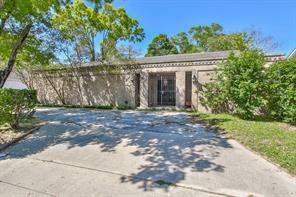 Over-sized garage, porte cochere, gated double-wide driveway. Back patio is covered w/grill station and TV. This home is perfectly located within Briargrove & boasts the best of everything*. *Per Seller. 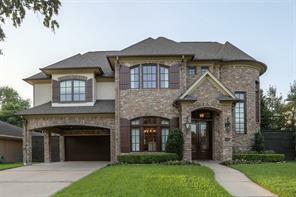 Sophisticated Briargrove home with spacious rooms and a great floor plan. This home is well appointed with front and back staircases, high ceilings, hardwood flooring, designer touches and custom built-ins throughout. Light-filled family room opens to breakfast room and gourmet kitchen and has two sets of French doors leading to the covered patio. Kitchen boasts a two-tier island, butler’s pantry, and top of the line stainless steel appliances. Spacious master suite features a sitting area with a fireplace, beautiful bathroom and large, walk-in closet. Secondary bedrooms have en-suite baths and walk-in closets. Downstairs game room has a large storage closet and full bath. Backyard has a covered patio with wood burning fireplace and heated pool/spa. The house is also equipped with electric driveway gate and 2-car garage. New home construction to be built By BlackStone Builders located in a beautiful corner lot in the pristine Briargrove neighborhood. Elegant finishes will be throughout the home with a special attention to flow, room purpose and natural light. Home will be completed in 2019 with 4 bedrooms. This is a perfect opportunity for the buyer to come in and customize the existing floor plans to meet their needs. 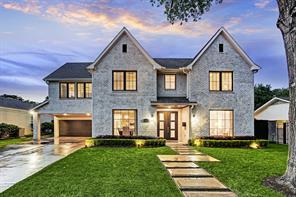 Stunning New Construction by a Texas Builder of the Year and GHBA Custom Builder Grand Award Winner! This floor plan offers it all and is perfect for daily living and entertaining. The Chef’s kitchen features custom built cabinets, Calcutta Quartz countertops, stainless appliances and separate breakfast area. The kitchen opens to the spacious living room with a fireplace and bar. The first level also offers a formal dining room, study, 1st floor guest suite with full bath and hardwoods throughout. The Master Retreat is on the 2nd level and features high ceilings, hardwood floors and a master bath that will make you swoon. Master bath offers a barrel vaulted ceiling, feature tile wall, designer light fixtures, wet area that includes the freestanding Jacuzzi tub and 2 person shower with double rain heads. The remaining 3 guest rooms are on the second level along with the game room and utility room. The yard does have room for a pool. This is a must see! 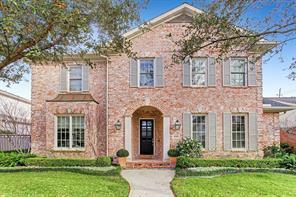 Gorgeous home in sought after Briargrove featuring an open floorplan, large family room, formals and a sizable kitchen with tons of storage, Thermador SS appliances, marble subway tiled backsplash, quartz countertop and island w/seating. This home contains hi efficiency 3 pane windows, wine bar w/166 bottle 2 zone cooler, bonus laundry room on 2nd floor, a gorgeous office with custom built ins, irrigation system, tankless water heater, Trane HVAC and an oversized master closet. Pool installed 2018 (per seller). 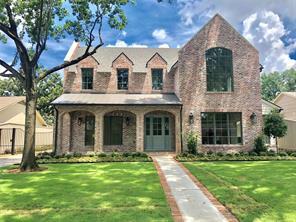 This gorgeous custom home in sought after Briargrove is a true gem. Enjoy the open concept floor plan with a spacious kitchen open to the living room that is perfect for daily living or entertaining. The Chef’s kitchen features custom built cabinets, Dacor gas range, Viking double ovens, Subzero refrigerator and an incredible oversized island. The first floor also offers a beautiful study, formal dining room, wet bar with ice maker, wine room and downstairs bedroom. The amazing Master Retreat is on the 2nd level and features high ceilings, fireplace, coffee bar with microwave and dishwasher, covered balcony and a master bath that will make you swoon. There are 3 guest rooms are on the second level along with the game room and utility room. Last but certainly not least, enjoy the covered veranda with summer kitchen and wood burning fireplace overlooking the beautiful pool and spa. 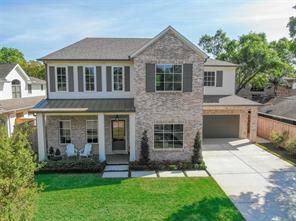 HL2143- This gorgeous new home, in the heart of Briar Grove, features 4 bedrooms with the master suite and guest bedroom, both on the first floor. One of the many great qualities of this home are the luxurious touches like the custom Benedettini Cabinetry, a custom closet in the master suite and wood floors throughout main living areas. The gourmet kitchen showcases shadow boxes, beautiful White and Grey painted cabinets and Thermador appliances including a built-in refrigerator. Upstairs includes a media room and game room! "Representative Photos -Not actual photos of floor Plan"
Freshly updated recent construction in Briargrove has a Hill Country vibe. First floor features open floor plan, updated Kitchen, open to the Living Room and Great Room, Formal Dining Room plus Library. First floor Master has spectacularly updated bath featuring a humongous marble clad shower, and huge walk-in closet. Upstairs are four bedrooms sharing dual, updated Hollywood baths all surrounding a Game Room. Up a secluded staircase is Quarters/Bedroom five. Backyard features covered patio pool and spa and summer kitchen. A virtual resort in Briargrove! 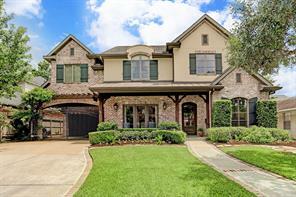 Gorgeous French-style home located in desirable Briargrove subdivision. 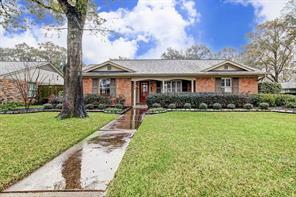 Minutes commute to Galleria, Memorial Tanglewood, and Uptown Park. Home features a stunning tropical paradise with a private pool, tanning deck, spa, and new cedar fence. Interior features an open floor plan with a wet bar ideal for hosting guests comfortably, four bedrooms, four-and-one-half baths, cathedral ceilings, hardwood floors, natural lighting fills the home throughout, remote controlled custom sunshades in the family room, custom shutters throughout, formal dining area with a custom built-in wine shelf, the kitchen is equipped with Thermador cooktop and Viking paneled refrigerator, winding staircase, gas fireplace, second story media room, surround sound ready indoors and outdoors. 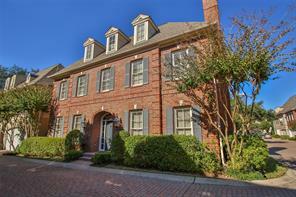 Spacious 2 story, 5 bedroom, 5 1/2 bath home located in Briargrove Subdivision. Briargrove neighborhood has a clubhouse, play area, community pool & an exceptional elementary school with a park making your new community a place of relaxation & peace. Features of this uniquely designed home include 20' ceilings, large windows, french doors overlooking back yard, a study with built in cabinets, wine room, 3 bedrooms with private access to balconies & so much more. Chef Inspired kitchen with granite counters, Island with seating space, double ovens & gas cook top. The Master Suite offers wet-bar with wine cooler & coffee maker, walk in closet with built ins, gorgeous granite counters with vanity area, dual sinks, relaxing spa tub & walk in shower with bench. The backyard gives you an in ground pool & Jacuzzi with retractable cover, outdoor kitchen, cover patio with ceiling fans, veranda & fire pits. Circular drive & exterior security/landscape lighting. Schedule your showing today! Amazing one-story home with a pool on a large, 13,575 sf (HCAD) pie-shaped lot. This is the ultimate entertaining home with open living areas, a wrap around yard, summer kitchen, multiple patios and grassy areas. The interior has been renovated to include hardwood floors, neutral colors, vaulted ceilings, a fabulous kitchen, breakfast room, wet bar, play/game room and a terrific master suite. The island kitchen boasts beautiful granite counters, a beverage cooler, gas range, stainless vent hood, SubZero refrigerator and tons of storage. The living and dining areas share a dual-sided gas fireplace with a terrific white brick surround. A spacious study and a game/play room are off the living area and have access to one of the back patios. The nicely-sized master suite has hardwood floors, vaulted ceilings and a bath with two sinks, beautiful marble, porcelain tile, claw-foot tub and shower. The backyard is unbelievable with a large pool, spa and plenty of room to relax and play. 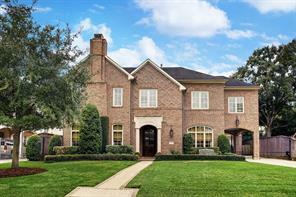 Stunning home in highly sought after Briargrove community. 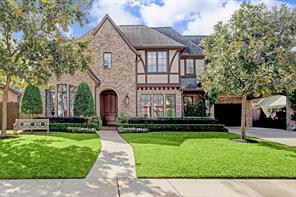 Home features an open floor plan - excellent for entertaining, large windows for plenty of natural light, oak wood floors, large cathedral ceilings w/ wood beams, formal dining room, butler's pantry and more. All bedrooms, guest suite with private bathroom, and bonus room upstairs. All bedrooms feature en suite bathrooms. Master suite features sitting area, study nook, and luxurious master bathroom. Outdoor space features expansive veranda, outdoor fireplace, cabana bathroom, large green space fenced in front yard - perfect for kids and/or pets! This home is located close to clubhouse, playground, pools and security post. This home is a must see! 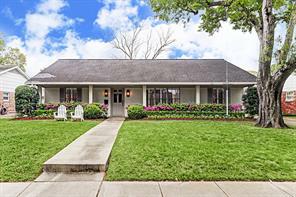 WALK TO WHOLE FOODS, Gated lock and leave lifestyle in a fabulous Tanglewood/Memorial location within walking distance to Whole Foods, shopping, dining, and Second Baptist Church. Gated luxury lifestyle with community pool coming soon. INSTALLED ELEVATOR. This home is in a prime location in the development with 3 balconies overlooking the community pool. 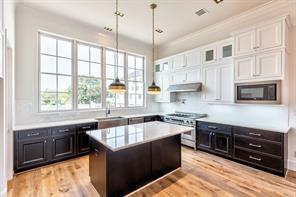 Chef's kitchen features Brookhaven by Woodmode fine cabinetry, and Miele German appliance package with double ovens. 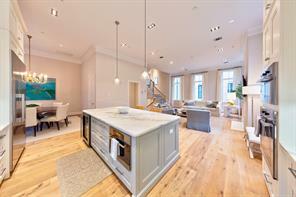 Wonderful open floor plan for entertaining with 12 ft ceilings in the living areas. Luxury finishes and plenty of Eco-Hip "green" features for low maintenance living. Wide plank wood flooring throughout, no carpet. Home is under construction and pictures are of similar Lovett Homes. NO flooding! Elegantly renovated from top to bottom, this 4BR/3BA Briargrove stunner boasts all the bells and whistles and is walking distance to Briargrove Elementary! Open concept living and a pergola adorned patio through lovely French doors. Contemporary wood cabinetry, gorgeous granite counters, sleek stainless steel appliances including double wall ovens, gas range and wine fridge. Unwind in your spa-like Master Suite w/soaking claw foot tub, frameless walk-in shower w/8-body spray + rainfall shower head. En-suite bath in secondary BR. Recently upgraded roof, siding, gutters, energy efficient dbl pane windows, high capacity tankless water heater & garage door w/smartphone compatible door opener. Enjoy easy access to Post Oak, San Felipe and Westheimer amenities, as well as 6-10 and HWY 59! 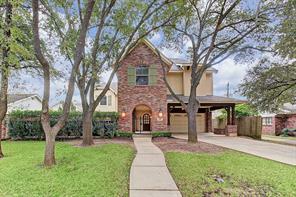 Stunning Briargrove home with 4 bedrooms and 3 full bathrooms! Large 4th bedroom is currently used as a gameroom/guest room and has its own en suite bathroom. Recently installed turf in this dreamy outdoor space. Sliding doors from the living room open up the living space which is perfect for entertaining. Open concept dining, living and kitchen. Kitchen boasts natural stone and Boos Block countertops, floating shelves and abundant storage. Large master bathroom with double closets, double sinks, oversized shower, tub and water closet. Hall bathroom was updated in 2018 and features marble countertops and floors. This is Briargrove ranch style living at its finest! Ranch style home in a prime location on the North side of Briargrove! This 3 bed, 2.5 bath home has great curb appeal & fully fenced, professionally landscaped backyard. The flexible floor plan offers a variety of entertainment spaces including an oversized living & dining area w/ plenty of room for large dinner parties, den w/ wall of French windows & doors, and open kitchen w/ SS appliances, gas cooktop, ample storage, and breakfast bar. Family room w/ elevated ceiling, built-in shelves & grand brick fireplace! The master suite has high ceilings, a door leading to the backyard, and an impressive en suite bath complete w/ standing shower, separate soaking tub, dual vanities, and 2 spacious walk-in closets w/ built-in drawers! 2 additional secondary bedrooms, hall bath w/ tub/shower, plus powder bath available for guests. Plantation shutters throughout, hardwood floors, tons of natural light, recent roof (2015), and 2 car detached garage w/ tons of storage! Automatic driveway gate! 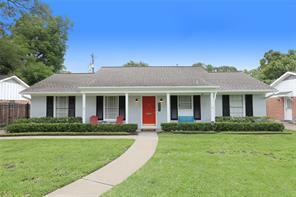 Charming 3 bedroom, 2.5 bath brick home on corner lot - gated sub. 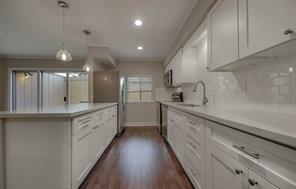 Kitchen renovated with high end appliances, cabinets, and granite countertops. Bathrooms remodeled with granite countertops, faucets, and glass shower door in master. Hardwood floors refinished. New carpet on second and third floors. Exterior light fixtures are Bevolo lamps from New Orleans. Beautiful landscaping all around. Brick patio in back has a ceiling fan and fountain. First floor has formal dining and living rooms, butler’s pantry, open den/ kitchen, 2 pantries. Two gas log fireplaces. Second floor has three bedrooms, sitting room off the master, two baths, linen closet, and laundry room adjacent to master. The third floor is a nice open space, with two closets, cabinets and bookcase. Per listing from 2002, the house is wired for an elevator, and plumbed for an additional bath on the third floor. A/C compressors and evaporator coils have recently been replaced. New roof in 2017. Additional parking space. 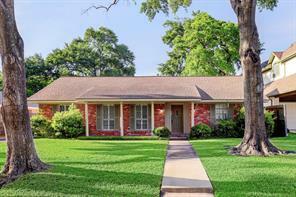 Spacious 3 or 4 bedroom, 3 1/2 bath Briargrove family home on large tree lined lot. 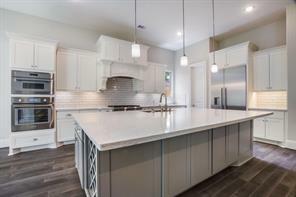 Granite kitchen with stainless steel appliances, opens to breakfast area and family room. Formal living and dining rooms. Family room with fireplace. Game room or 4th bedroom, offers homeowner many options. Inviting master with large walk-in closets. Master bath with double sinks, tub and separate shower. Home office with built-ins. 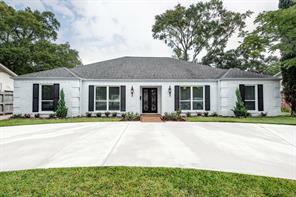 Features include: wood and tile flooring, double pane windows, French doors, recessed lighting and plantation shutters. Recent fresh paint. Utility room with half bath. Covered patio opens to large backyard. Side-by-side parking on driveway. Two car garage with access to the back yard. This one is a must see! What a find in Briargrove! 4 bedrooms, 3.5 baths with updated* kitchen and full master suite addition (2003*). Well positioned in the middle of a quiet street, you'll fit right in to this amazing community of great neighbors! Walking distance from community pool and Briargrove Elementary (buyer to verify eligibility). Air-conditioned bonus room over garage (not included in HCAD square footage) provides ~ 300* sf of office, game/media room, or storage to this already spacious home. Plantation shutters, hardwoods throughout, built-ins, and more make this home truly stand out among the rest! Side yard has room for a playscape and a great patio with outdoor kitchen area. Great flow with full-sized wet bar for entertaining. Updates include high ceilings in living room/master*, recent double-paned windows*, recent HVAC*, updated plumbing and electrical*, security cameras*. *per Seller. Property is being sold "as is." 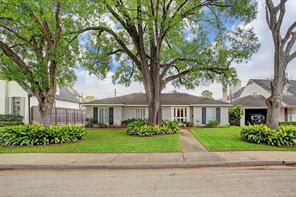 An excellent opportunity to purchase on the desirable North side of Briargrove. 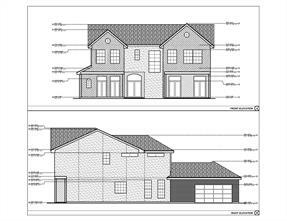 Seller is offering house plans by architect Travis Mattingly with the sale of the property. This 8,250 SF lot is perfect to refurbish or tear down and build a dream home. Original Owners offer this lovely custom built red brick patio home on a corner lot in this small gated community. Double pane windows with solar film + HVAC zoned separately to each floor = lower utility costs. Hardwoods throughout (no carpeting!). Chef's kitchen features an oversized island, lots of storage, Jennair gas cooktop (6 burners or 4+grill) Thermador double ovens and Bosch dishwasher. Bedrooms up with shutters on all windows. An extra room between the spacious master bedroom (w/fireplace) and bath accommodates exercise equipment and wet/coffee bar. Luxurious master bath with Ultra Thermal whirlpool tub with 44 air-jets, 2 walk-in closets. Amazing project room on the third floor outfitted with a work desk could also be the perfect gameroom/den, media room. Garage outfitted with storage. Low maintenance "Secret Garden". 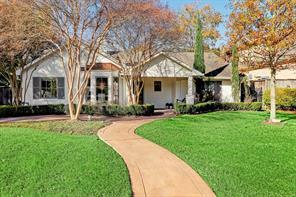 Beautiful Tanglewood area patio home on large lot with additional driveway parking. 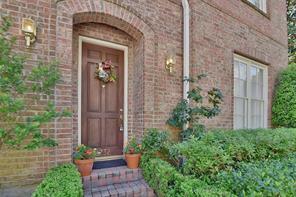 Beautifully landscaped private patio is accessed through French doors in the living room. The island kitchen with counter seating has been beautifully updated and opens to the living and formal dining rooms on the first floor. Crown molding and hardwood floors provide an elegant touch. The gracious second floor master bedroom has vaulted ceilings, two large walk-in closets and elegantly renovated bath with expanded walk-in shower and separate tub. Two additional bedrooms with en suite baths and large closets are also located on the second floor. A third floor versatile room with full bath can function as a game room, office or fourth bedroom. Storage spaces abound throughout the house. The sellers have recently installed roof (2017), HVAC and tankless water heater. Elevator capable. Luxurious Home in Attractive Gated Enclave Tastefully updated in 2015-2016! Walk to Wholefoods or Trader's Joe. Stunning Kitchen, Bathrooms, Custom Cabinets, Hardware, Fixtures, Granite, Shower Doors, Glass Tile, Top-Of-The-Line SS Appliances & New AC Units 2016. 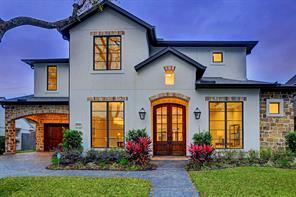 Open Floorplan w High Ceilings, Crown-Molding, Neutral Colors & Plantation Shutters Throughout. All Living Areas Down + All 4 Bedrooms Up WITH Custom ELEVATOR. Refinished Hardwood Floors Down + Upgraded Carpet Up. Large Private BackYard, Landscaped to Perfection with a comfortable Deck outside! High and Dry in Harvey. Great community and caring neighbors. NO FLOODING WHATSOEVER. 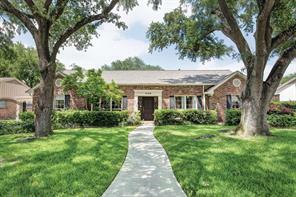 WALK TO WHOLE FOODS, Community POOL coming soon, GATED LOCK & LEAVE LIFESTYLE in a fabulous Tanglewood/Memorial location within walking distance to Whole Foods, numerous restaurants, shopping, & Second Baptist Church. Gated luxury lifestyle with 39 homes and community pool. INSTALLED ELEVATOR, game room opens to a fabulous roof top terrace. Fantastic location in the community with pool view, 2 balconies, chef's kitchen features high end Miele German appliance package & custom double stacked cabinetry with soft close drawers and doors. 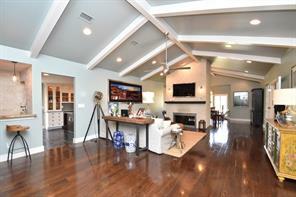 Wonderful open floor plan for entertaining with 12ft ceilings in the living area. Luxury finishes and plenty of Eco-Hip "green" features for low maintenance living. Wide plank wood flooring throughout, no carpet. Pictures are of similar Lovett Homes. Luxurious Home & timeless decor in an attractive, gated enclave with an ELEVATOR - taking you to one of the 3 bedrooms on the 2nd floor. Comes with 2 year home warranty & new paint prior to closing! Buyer will choose color! Tastefully updated in 2015-2016! Walk to Wholefoods ,Trader's Joe or Escalante's. Custom Cabinets, Hardware, Fixtures, Granite, Shower Doors, Glass Tile, Top-Of-The-Line SS Appliances & Newer AC Units (2016). 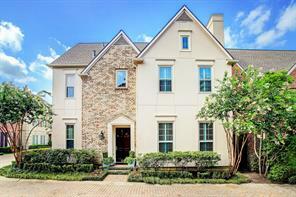 Open Floorplan w High Ceilings, Crown-Molding, Neutral Colors & Plantation Shutters Throughout. All Living Areas Down + All 4 bedrooms up (3 bedrooms on 2nd floor and 1 bedroom on 3rd floor). Refinished Hardwood Floors Down + Upgraded Carpet Up. Large Private BackYard, Landscaped to Perfection with a comfortable Deck outside! Nothing behind, so great views of tree line. High and Dry in Harvey- NO FLOODING WHATSOEVER. Great community and caring neighbors. Never flooded, high and dry, zoned to Briargrove Elementary! This light and bright two-story home has high ceilings throughout. A major perk for those seeking large bedrooms, bathrooms and closets! It has not one, but TWO master bedrooms - one on each floor - each with large master bathrooms and double sinks, double walk-in closets, private WC, and whirlpool tubs. The closet in the third bedroom (the "Pink Room") was massively renovated in 2015. New, new, new! 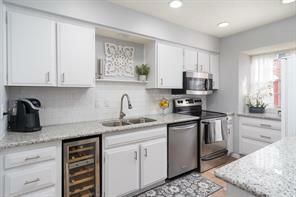 Throughout the home you will see new paint, refinished floors, new LED lighting, new light sockets/switches, new sinks, new toilets, new countertops, new hardware (faucets, knobs, towel racks, etc. ), new cabinets, new backsplash and Bosch appliances in kitchen, and remodeled Carrera marble fireplace. The exterior was freshened up with new landscaping, lighting fixtures, fencing, paint and stain. 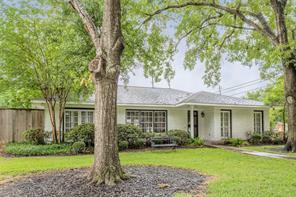 An opportunity to call this stunning remodeled 1960s charmer home in sought-after Briargrove equipped with all the must haves! This home sits on a tree-lined street with FOUR bedrooms, detached garage, privacy gate, sprawling professionally landscaped yard (with sprinkler system), countless updates including chefs kitchen (with stainless steel appliances), master bath retreat with TWO master suite closets and french doors leading to backyard, gleaming hardwood floors found throughout, designer paint, upgraded windows, hardware and lighting package, an in home utility room and much more! A true impressive interior AND exterior - All found in coveted location. A true rare find on premium street! A home where quality meets traditional charm. A hard to find home that boasts transitional space, generously sized rooms, thoughtful layout and plethora of storage all coupled with boast-worthy attention to detail and care. A home that checks EVERY BOX! Wonderful 3 bedroom, 2 bath, Briargrove family home on large lot. Spacious family room with built-ins & vaulted ceiling. Granite kitchen with new appliances & under cabinet lighting. Breakfast area. Kids playroom off kitchen. Inviting master suite. Features include: hardwood & tile flooring, recessed lighting, ceiling fans, and french doors. Alarm system, electric iron entry gate, sprinkler system. In house utility room. Close walk to park. A must see! 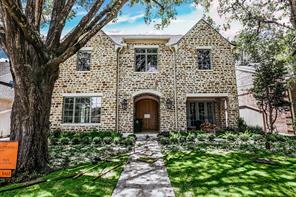 Exceptional home in gated community with seller providing a 1 year home warranty. NEW photos show interior designer chosen new neutral paint colors & new carpet. 4/3 bedrooms 3.5 baths & elevator. Open kitchen with adjoining family room leads to a landscaped private terrace. Gas log fireplace in family room. Elegant formals, floor to ceiling windows, plantation shutters, & rich hardwood floors. Self-cleaning convection SS smart double oven & smart SS refrigerator. Oversized master bedroom has 2 closets on either side of sunken tub & oversized separate shower. Each bedroom has an ensuite bathroom. Large utility on the second level. Third floor could be a nursery or 4th bedroom or game room or office. Elevator is outside of bedrooms 2 & 3. 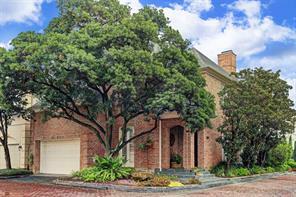 Convenient to I-10/610, the Galleria, Memorial, Houston CC, & Houston Racquet Club. 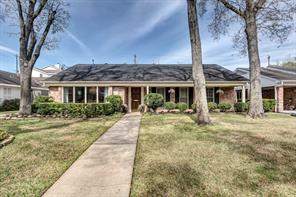 Walking distance to Second Baptist, Trader Joe's, Whole Foods, Escalante's, Paris Texas, & French Cuff Boutique. Less than 2 miles from Kinkaid. Never flooded! Beautiful double front doors welcome you to this pristine, impeccable, elegant patio home in small gated area of Woodway Square consisting of only 6 homes. Only 15 homes in the community. Elevator! Walk to restaurants, fitness studio, grocery, pharmacy and more. Open floor plan, beautiful moldings, gas log fireplace light and bright morning room. Tall ceilings. Hardwoods down. Plantation shutters and built in are just some of the many features. Kitchen has beautiful granite counters with stone backsplash. Abundant storage. Kitchen Aid four burner gas cooktop new in 2018. Bosch dishwasher. Planning desk. Lovely generously sized dining room. Large family room is wired for surround sound. New patterned driveway in 2016. Dual closets and dual sinks in master bath. Cozy area off master can be used for a study, office or TV room. Seating area also in master bedroom. Laundry room on second floor. Wool carpet on stairs. Neutral colors. This is an exceptional home. NEW neutral paint upstairs. 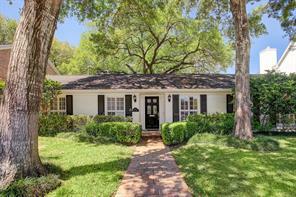 You will love this classic Ranch in sought-after Briargrove. This nicely updated home features beautiful hardwood floors in the living areas and bedrooms, along with elegant crown molding. The updated kitchen features granite counters, undermount sink, stainless appliances, and a great gas cooktop. The master suite boasts double closets and the bathroom has a frameless shower and dual sinks. In the backyard, you have a covered patio with slate flooring to enjoy the outdoors. Property also features and automatic gate and sprinkler system. This one won't last long. Schedule your appointment today! 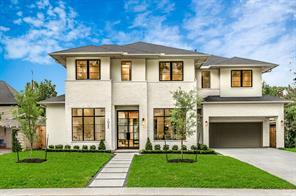 Surrounded by new construction and tree lined street make this one of Houston's most sought after neighborhoods. Situated on a beautiful lot with mature trees, this three bedroom, formal living, formal dining and oversized family room with nice size back yard make this home an ideal opportunity to remodel now and build later. Electronic driveway gate and generator! Easy to show and ready for your personal touch! 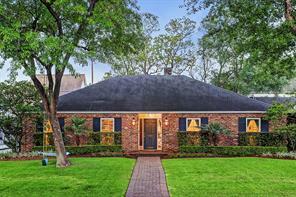 Wonderful home in Briargrove with 3 bedrooms and 2 bathrooms on a beautiful tree lined lot! Light and bright kitchen with breakfast room, and open to family room with lovely French doors to backyard patio. Great space for entertaining! Hardwood floors throughout living areas and bedrooms. Beautifully renovated bathrooms (2013 per seller) with designer window treatments and fixtures. Many more highlights include sprinkler system, electric driveway gate, built-in shelves, and plantation shutters. 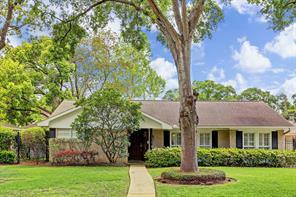 Light & bright 3 bedroom, 2 bath Briargrove family home on tree lined corner lot. Spacious kitchen with butcher block countertops, opens to breakfast area. Formal living room. Inviting dining area. Large family room opens to back patio. Features include: French doors, plantation shutters, hardwood & tile flooring. Updates include: a new HVAC and hot water heater in 2017, sprinkler system / drains installed and custom pergola built with rain cover on back patio in 2018, as well as, landscaping in 2018. Two car garage with great storage. Electric driveway entry gate. Covered back patio, great for entertaining. Nice back and side yard areas ideal for kids. Close walk to neighborhood pool, restaurants & shopping. Do miss this wonderful opportunity for Briargrove! 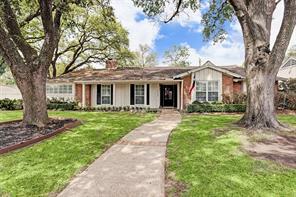 Tastefully updated ranch style home in Briargrove! 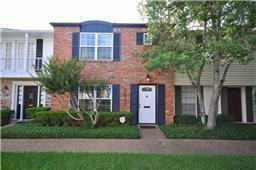 Convenient location to Galleria, restaurants, shopping, and schools. This home was remodeled in 2010 and has an ample sized private pool with a gorgeous pergola perfect for outdoor entertaining. Entertainment room and master bedroom have recessed lighting and connections for surround sound. Lots of natural light throughout. Has a front entrance and a separate side entrance. Also has a two car garage with an attached carport for additional parking. Oversized 11,316 SF lot priced to sell. Minutes from the Galleria, easy access and proximity to fine dining, gourmet grocery stores and retail. This jewel is optimal for creating your dream home on one of the largest lots in Briargrove. Situated in a well established neighborhood in Briargrove, a community private pool with clubhouse, a short walk to beautiful area parks, and Briargrove Elementary. DID NOT FLOOD DURING HARVEY! Selling as is, owner will not make any repairs. House house sits on San Felipe with circle driveway on front of the house. Wonderful opportunity to get into desirable Briargrove subdivision. Tear down and build or restore the charm of this three bedroom, two bath home. Saltillo tile in main living areas, hardwood floors in the master. In-ground pool with rock waterfall. 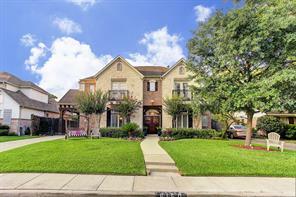 IMMACULATE HOME NEAR THE GALLERIA! This 2 bedroom, 2.5 bath has been beautifully cared for! Modern kitchen with QUARTZ countertops, subway tile backsplash, new stainless steel appliances, motion sensor faucet, decorative pendant lights & a open concept to the dining area! Large living room with gas log fireplace with decorative surround, 7mm wood laminate flooring throughout 1st floor, & a great layout for entertaining! Awesome patio that was recently sealed! 1 car garage and 1 carport. Large master bedroom with dual closets, new carpet, plantation shutters, & a new ceiling fan. Amazing master bathroom with QUARTZ countertops, dual vanities, updated light fixtures, brushed nickel hardware & a subway tile shower surround. 2nd bedroom has its own bathroom with all the high end finishes! New water heater, new laundry room, new light fixtures, blinds & outlets throughout! Short drive to the Galleria & walkable to so many great restaurants! Tucked away from busy roads! See it today! 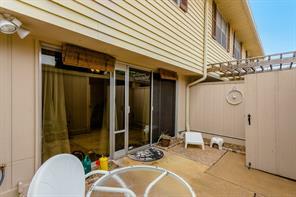 Very lovely, spacious townhome with all of the conveniences + a great location. Kitchen and bath updates, large closets, easy care tile floors down. Sleek European kitchen is very appealing + pantry space. Powder room is convenient for guests. Quality sliding doors lead to a bright patio and two car enclosed garage space. Bedrooms are large and each have a private bath with walk in shower. Owners moving back to England and will consider offers for any furniture the buyer may want to keep. Room sizes are approximate. 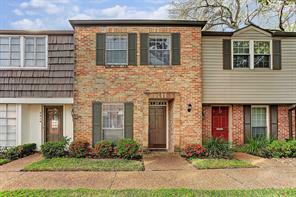 Beautiful, updated Briargrove Townhome minutes from the Galleria, Highland Village and Uptown Park. 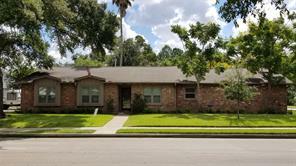 Home features include crown molding, popular off set tile, recessed lighting, 2 inch blinds, bronzed hardware/fixtures, master shower, patio door, double paned windows, granite counters, kitchen cabinets/appliances & AC., garage door opener, glass paneled front door,recent stackable washer/dryer. Zoned to Briargrove and Tanglewood schools. Walking distance to restaurants, shopping & night life. 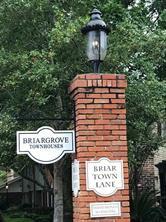 Charming, well maintained condo located in desirable Briargrove community. Easy maintenance Saltillo tile and wood flooring throughout main living area. Nicely updated kitchen with beautiful countertops and tile backsplash. All bedrooms upstairs with oversized Jack & Jill bathroom. Painted in wonderful, warm tones throughout with elegant touches enhanced by stunning crown molding. Built-in display bookcase on stairway landing adds architectural interest and great storage! Wet bar and sunroom off the living room leads to the private patio. Gorgeous brick exterior with lush greenery off the private patio, and a well manicured landscape throughout the community. Back on the market Y’all! 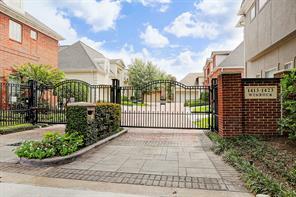 You do not want to miss an opportunity to own this impeccable Galleria Townhome located in the prestigious Briargrove neighborhood. This home has been well cared for & features awesome updates. Brand New double-pane energy efficient French doors & windows in the living area which open up to your own private patio which lead to your garage w/keyless remote, Brand New Water Heater & High Efficiency HVAC system that is less than 2 years old! The kitchen boast granite countertops, subway tile backsplash, SS appliances, under mount sink, wine nook, dry bar, walk in pantry & plenty of cabinet space. Full bath upstairs features marble countertop, shower/tub combo with floor to ceiling subway tiling & new fixtures. Fresh paint throughout, recessed lighting, laminate flooring downstairs, new carpet upstairs & on stairs. Built-ins & storage galore! The location is perfect, close to major highways, tons of shopping, restaurants & entertainment all at your fingertips. Welcome Home! 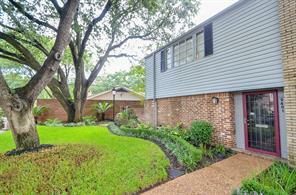 Charming townhome/condo located in the highly sought after Galleria area. With easy access to the best of what Houston has to offer. This home remained high and dry through Harvey! Home was just updated and freshly painted with new fixtures added! Home is beautifully maintained and features 2 large bedrooms, 1.5 bathrooms and an office nook. 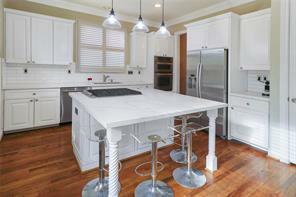 The large galley kitchen has beautiful white cabinets, plenty of storage and sleek Corian countertops. Elegant and easy to maintain wood laminate floors throughout the first floor. Relax in your 16x13 master suite with plenty of privacy and his & her closets! Second bedroom is almost as big as the first. Lovely backyard patio perfect for enjoying the outdoors. Secured/private covered carport offers extra space and storage, plus 1 car garage with safe, private entrance to carport. 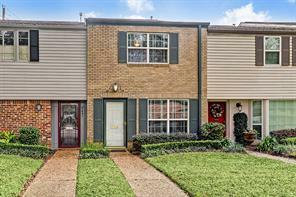 Charming two story, three bedroom townhouse ideally located within minutes from 610, 59, the Galleria, Memorial Park & more! Tile flooring throughout first floor, stainless steel appliances, fresh paint, patio area, covered carport & more. Located at the end of the street so this home only has direct neighbors on one side. Community pool. Well located near the Galleria, this unit in Briargrove T/H Condos is ready for move-in, All furnishings are available and negotiable.